Is a coffee break a good idea to relive migrain symptoms? Caffeine seems to both causes and relieve migraine symptoms, how is it possible? That is the so-called caffeine paradox. 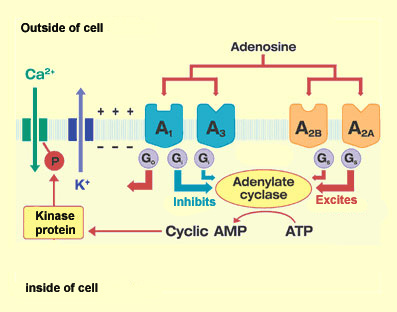 - decrease the rate of the reuptake of adenosine from synapses (increasing the number of membrane transporters). - the central problem with the vascular theory, however, is that it assumes vascular changes cause migraine symptoms, when there are other logical possibilities: the headache could cause the vascular dilation, or a third factor could cause both the vascular dilation and the headache. Another theory is that caffeine in combination headache medicines works by enhancing the effects of the medicines it's combined with. One proposed mechanism for the adjuvant effect of caffeine is that caffeine expedites delivery of the other medicines by speeding up absorption of the medicines through the gut wall into the bloodstream, or by increasing heart rate, thereby speeding the hero medicines on their way. The adjuvant theory doesn't explain why caffeine all by itself often effectively aborts headache, and has an analgesic effect on headache independent of other medicines. Moreover, because oftentimes caffeine all by itself aborts headache, the so-called adjuvant or synergistic effect of caffeine would be difficult to demonstrate. If a caffeine-containing combination headache medicine aborts a headache, it would be hard to determine how much of the credit goes to an adjuvant effect of caffeine rather than to the intrinsic ability of caffeine to abort headache. But caffeine does slow the rate at which aspirin and acetaminophen (paracetamol, Tylenol) are metabolized, so could make aspirin and acetaminophen more effective by keeping them in the body longer and at a higher concentration. curves for acetylsalicylic acid (ASA) alone (squares) and combined with caffeine (CAF, triangles), on the inhibition of mechanical hyperalgesia (% MPE), 3 h after CA-induced inflammation. Each point represents mean values of at least eight rats and vertical bars indicate SEM. ∗ indicates statistically significant differences (p < 0.05; Student’s t test) between treatments. 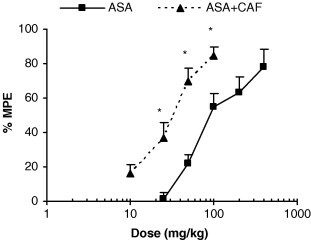 It is evident that the same dose of ASA combined with CAF has greater effects that ASA alone. - vasodilation of the vessels in the neck and in the head (see Vascular Theory). - Family History: Genetic factors play a large role in those suffering from migraine headaches. Studies have shown up to 90 percent of people with migraine headaches have a family history of them and studies say that those individuals that come from a family history of migraine headaches will most likely be at risk of suffering from chronic migraine headaches as well. - Age: During childhood, migraine headaches are less frequent but not nonexistent. Research has shown that most individuals will experience their first migraine headaches during adolescence, and by age 40, most people who will suffer from migraine headaches will have had their first attack. - Gender: It is a commonly known fact that more people who suffer from migraine headaches tend to be female. Hormonal changes seem to play a very large role in the case of migraines. During childhood or adolescents, the frequencies of migraine headaches between sexes were not that different but a drastic increase in migraine headaches in females become apparent as they neared puberty. The reason behind this statistic seems to reside in the case of estrogen, its levels, and its effects on migraine headaches. This is also why women often complain more of migraines around the time of their monthly cycle. - Medical Issues: Individuals who are have medical issues such as depression, anxiety; stroke, epilepsy and high blood pressure are more susceptible to migraine headaches than people who have not suffered with any of the listed medical concerns. According on the previous views, the caffeine paradox is explained assuming that caffeine causes headaches by provoking neurochemical dependency due to adaptation events, the nervous system, therefore, became susceptible to caffeine withdrawal headaches, caffeine relieve migrain reversing the effects of abstinence, causing vasoconstriction (as an antagonist of adenosine vasodilation activity) and by adjuvating the effects of analgesic drugs.